Georgii Tautiev is another young Ossetian athlete who also showed an excellent result at the last tournament and became the European champion in 2017 among seniors. 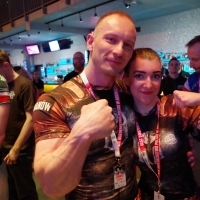 "I started arm wrestling in 2010 because of my sister, because she also did it and took me to training several times. I immediately liked this sport". "I consider my most significant victory to be my victory among juniors in 2013 at the World Championships in Poland, because then I had very serious rivals, and I managed to win all them. After that victory, I felt some confidence in my abilities. I also consider as important the victory in senior class at the last European Championships, as this is a new level, and it's more pleasant to win there". "Arkaeva Oksana trains me, she always worries and cheers for me, and I am very thankful for it. In my training I prefer to pull at the table, there is nothing better than this. I train on average five days a week, basically it depends on my overall condition. I take about two months to prepare for a certain tournament". "At the moment my weight is 80 kg. Before the European Championships, I had a good preparation and workouts, and during the training my weight reached 85 kg. After it was necessary to lose a little weight to fit the weight category, and I still have not gin back my 85 kg". "At the European Championships, I thought Zurab Tavberidze was the strongest contender. I watched his fight when I fought among juniors and considered him the most dangerous rival. And I was surprised of course by Tsvetan Gashevsky, if we talk about my category, to pull at such age – it's worth a lot". "In general, the team performed well, but mostly at the expense of juniors. Soslan Gassiev shown excellent work, taking third place in the adults, a little experience was not enough for him to win. We also have invalids who have not left their rivals any chances, it was especially pleasant for them. I remember nothing unpredictable in this tournament, to be honest, everything was normal. Maybe my victory was unpredictable for me". "Next, I have a tough schedule and a lot of starts, I'll have to prepare seriously for them. And I really hope that you will see me at the World Championships, I really want that". We will follow the performances of this athlete. And what do you think about Georgy Tautiev's prospects? Write your comments and watch the news on armpower.net.